The Lakeside Palmetum is beginning to grow into prominence three decades after its founding on the shores of Lake Merritt. 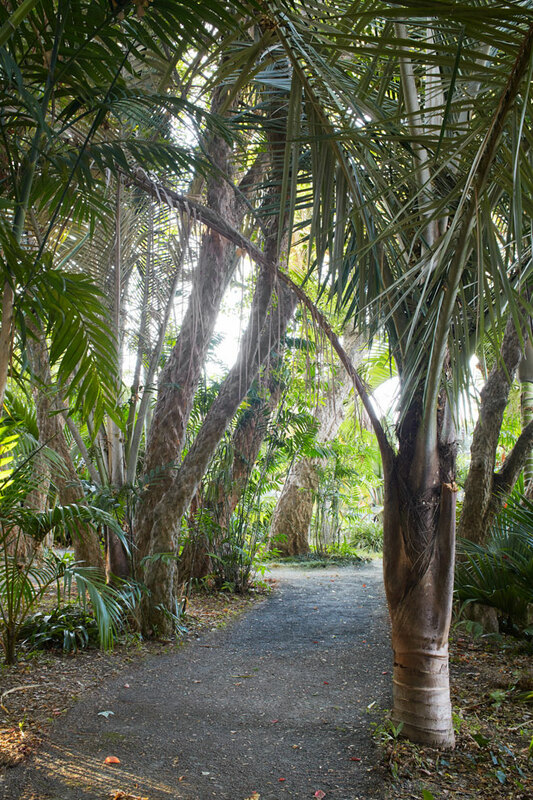 The Lakeside Palmetum’s botanical collection compares with others on the West Coast—more than 70 species grow there—but its selection of cool-climate palms that thrive in the coastal fog belt sets it apart. Chief among these are the wax palms of the Andes, Ceroxylon, and their compatriots, the mountain coconuts, Parajubaea. Members of the Northern California Chapter of the International Palm Society began planting the Palmetum in 1982. It comprises one of the most extensive collections of subtropical and cool-climate palms in North America. Many of its rare species from South America, Australia, New Zealand, Mexico, Central America, Africa, Europe, the United States, and Asia are now reaching flowering age and pushing their crowns against the horizon. Second- and even third-generation seedlings are appearing where irrigation allows. The Lakeside Palmetum is tucked at the back of a public collection of themed gardens, The Gardens at Lake Merritt, which cluster around a sturdy 1950s-era modernist garden center. It is still obscure except to palm aficionados, for whom the garden’s rare cool-climate-loving species are legendary. Lake Merritt’s lobes enclose Lakeside Park and insulate this quilt of trees (many of them oaks) from city traffic and occasional freezes that descend upon Oakland’s bayside flats. A serpentine loop path through the Palmetum draws visitors through the collection from sun into the shade of veteran trident maples, Acer buergerianum, around a sheltering mound, and out again into sunshine increasingly filtered through the jostling fronds of mature palms. Growing amidst the maples is the tallest of all palms—and thus of all monocots—Ceroxylon quindiuense, Quindio wax palm, or palma de cera del quindio. It is Colombia’s national tree and is native to cloud forests (many now cut for pastures) at elevations of 8000 to 9200 feet above sea level along the upper Quindio River in the Valle del Cocora. This species reaches nearly 200 feet tall, lifting its 20-foot-long plumes of shiny green leaves and clusters of red fruits into the cloudy skies. A genus of nearly 20 species, the wax palms get their name from the layer of wax coating their conspicuously ringed trunks. They are all confined to the foothills and forested heights of the Andes. For its aficionados, the moment a palm tree starts showing its trunk is a significant occasion. The revelation of the trunk cylinder’s surface as older leaves detach from the base of a palm’s crown is the beginning of that plant’s commencement into “treehood.” For slow-growing palms such as wax palms, the wait can take decades. 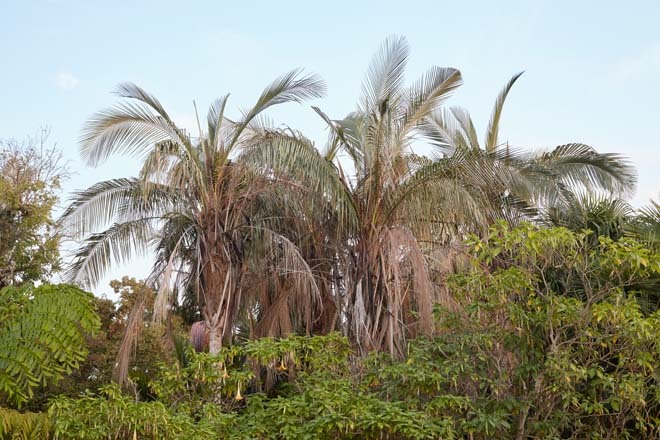 In the last ten years, waxy white internodes broken by rings of dark leaf scars have become visible on the massive trunks of adolescent Quindio wax palms rising through the canopy at the Lakeside Palmetum; eventually the huge feather-duster crowns will become skyline elements, like the rows of old Mexican fan palms around town. 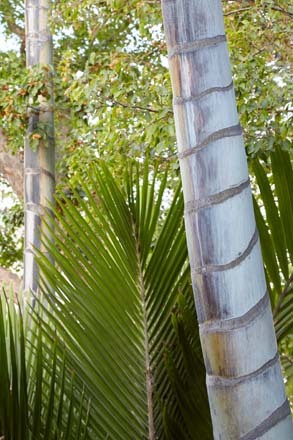 Two specimens of a smaller wax palm species at the edge of the maple grove, Ceroxylon vogelianum, feature a thinner, 20-foot-tall, smooth gray-green trunk with rings canted at 45 degrees. These specimens are the first of their genus to reach flowering age in North American cultivation. In sexual maturity their ostrich-feather foliage has loosened into a hemispheric arrangement around straw-colored tassels of flowers. All the young wax palms in the Palmetum reveal a silver satin on the undersides of their upright leaves as breezes rustle the canopy, flicking green, now silver, into view. The parallel leaflets on some, like Ceroxylon alpinum, from slopes just below Quindio wax palm habitat, give the impression of Venetian blinds rendered in foliage. Its trunk just emerging, this species is the newest to graduate from juvenile rosette form into arborescence at the Palmetum. Its luxuriant, perfectly proportioned feather-shaped leaves are a most unexpected understory to the burly trees that protect them. Outside the wooded portion of the garden grows a quartet of mature Parajubaea cocoides, the coquito palm from Ecuador and Peru. Resembling a scruffy, straight-trunked, glaucous coconut palm (hence the species name) it produces miniature, edible coconuts on top of a gray trunk. Its long, curving, feather-shaped leaves—shiny on top and silky gray beneath—swing in bay breezes. A commonly cultivated street tree in Quito, Ecuador, one natural population was recently discovered in a high-altitude cloud forest in northern Peru that is mostly now denuded. 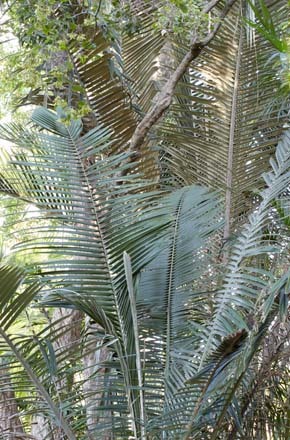 Three other taxa in the genus, Parajubaea sunkha, P. torallyi var. torallyi, and P. torallyi var. microcarpa, come from high elevations in the Bolivian Andes. Unlike its Andean neighbors, Parajubaea species prefer sunshine in cultivation and grow quite quickly by California palm standards. 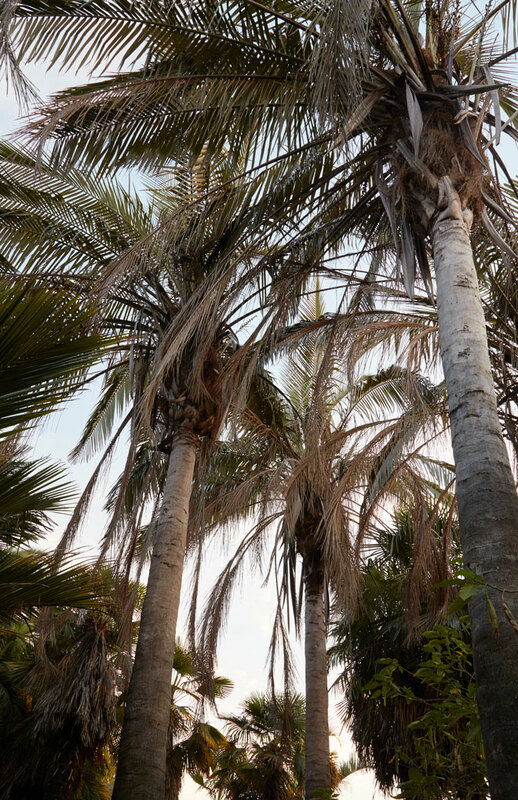 Parajubaea cocoides is the most particular of the genus, preferring cool summer weather and mild, mostly frost-free winters, making it a promising plant for coastal California. Equally tolerant of cool summers, the higher-latitude Bolivian species adapt better to summer heat, winter frost, and drought, making them excellent prospects for the coast and further inland. All produce miniature coconuts, edible to those with the tenacity to break their thick shells. Protected by the maple canopy, the palm garden’s bamboo palms (Chamaedorea spp.) from Mexico and Central America form thickets of thin, green stems and finely divided, feathery leaves. Their numerous yellow-green inflorescences have a clean, pleasing scent. Cool-weather-loving nikau palms, Rhopalostylis sapida, Norfolk Island palms, R. baueri, and umbrella palms, Hedyscepe canterburyana (from New Zealand, Norfolk Island, and Lord Howe Island, respectively), share the shade, where they produce squid-form stalks covered in hundreds of flowers—a bee banquet. Their crownshafts consist of cylindrical leaf bases that gather the feathery foliage into upright bouquets, flouncy on the umbrella and Norfolk palms, stiff and architectural on the nikau. The old, dying leaves peel off cleanly to reveal the next leaf scar, inflorescence, the smooth green internode on the palm’s trunk, and the fresh leaf base above. Nearby, clusters of the slow-growing Chinese fan palm, Livistona chinensis, barely beginning to show trunks after 30 years, splay their broad fans. The delicate, vining rattan palm from Australia, Calamus caryotoides, lashes its barbed threads onto surrounding plants to climb upward. King palms (Archontophoenix cunninghamiana) stand majestically at the edge of the maple grove. Pendulous, fleshy tassels of lavender flowers below their green crownshafts break their smooth silhouette. Fine tentacles ripen to garlands of bright red berries. The oldest king palms’ trunks show damage from the severe freeze of December 1990, when low temperatures reached the mid-20s °F on several nights and damaged numerous plants in the Palmetum, although most survived. Illawarra king palms—from the species’ southernmost New South Wales habitat—were planted after the freeze and have now outgrown their scarred elders. 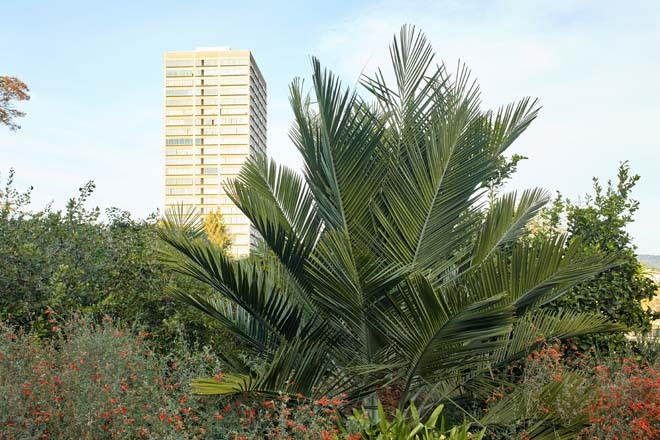 The sunny zones of the Palmetum feature the hardy and versatile South American pindo palm, Butia odorata, the luscious, speedy, and underused Australian Livistona fan palms, such as L. australis and L. decora. 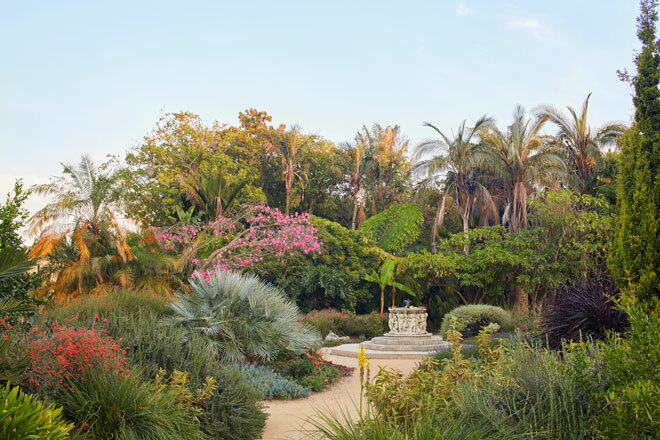 Members of the drought-loving genus Brahea, like B. edulis, the quasi-native Guadalupe palm, and B. armata, the spectacular Mexican blue fan palm, also appreciate sun. A behemoth Chilean wine palm, Jubaea chilensis, perches on a mound at the edge of the shade zone, its obese trunk an elephant among gazelles, its dense crown of vinyl-texture feather leaves a bonfire of dark green. This tree will endure any extremity of drought or cold Oakland can throw at it, produce copious delicious coquito nuts, and, with the potential to live for centuries, mature into the most majestic of palm species.